Keep your wood fence looking great this summer by maintaining it year-round. If you want to get the most beautiful years out of your wood fence, then you will want to be sure to maintain it year-round, whether it’s winter or spring. However, different seasons require different protective maintenance, and doing the exact same things year round will not do very much for your wood fence. Summer brings its own challenges, such as humidity, heat, and sunlight. 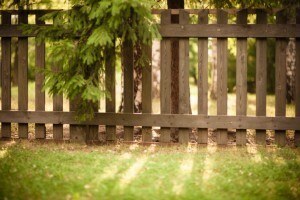 In order to care for your wood fence in the summer, take these steps. Firstly, you will need to remove any excess debris that has gathered around your fence. If you do not take care of this promptly, the spring rains and morning dew will gather in any leaves and debris touching your fence, meaning your fence will constantly be exposed to damaging moisture. This can lead to serious issues in the future such as mold growth, mildew, insect infestation, and fence rot. These can be expensive to repair, and if extensive enough lead to the necessity of wood fence replacement. Summer is known for heavy storms, which bring heavy rains, strong winds, and thunder and lightening. Falling tree branches can damage your wood fence, so make sure all of your trees are trimmed before storm season sets in. There are a number of things which can make your fence look dirty. From storms to bird droppings to cars blowing dust as they pass to your lawnmower throwing dirt and grass at it, a lot stands between you and a clean fence. A power washer can easily clean your fence when used properly. This entry was posted on Thursday, May 26th, 2016 at 1:28 pm. Both comments and pings are currently closed.